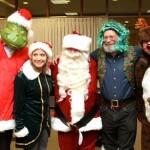 Holiday characters: The Grinch (ably portrayed by Hyundai’s Joe Guy Collier, who in fact stole nothing, much less Christmas), Mercedes-Benz elf Elizabeth Williams, jolly St. Nick himself, Newport Concours founder Mark Hurwitz and, in reindeer drag, photographer Greg Jarem. 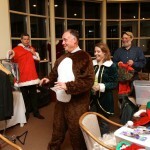 Backstage at the Globe: Collier, Jarem, Williams and Hurwitz manage to get into character without the benefit of an aperitif. 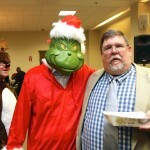 The Grinch checks NEMPA President Keith Griffin’s plate while Rudolf flies cover. 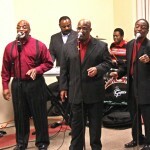 Entertainment by gospel singers the Bullock Brothers. 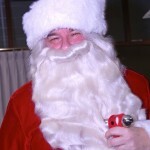 Yes, Virginia, there really is a Santa. And sometimes he delivers cars to good little boys and girls. If anyone has seen Santa and the elf since the party, please call 508-378-3023. 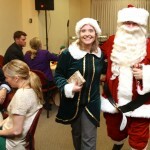 Wish I could have been at the Globe Christmas party to share the holiday cheer! Belated Merry Christmas and a Happy and Healthy New Year to my fellow NEMPA Members, Bugsy and all the good folks at Automotion, and of course, all the fine people at the car companies that all of us at NEMPA know and Love!